What are the differences in the Hermle Skeleton Wall Clocks? There are several upgrades in the construction of the Hermle Premium Series skeleton wall clocks over their less expensive Standard Series. The overall construction of the Premium Series is heavier and these use a more expensive movement which will last longer under the conditions.The movement supports are heavier with considerably more brass and a wider flange which is much sturdier. 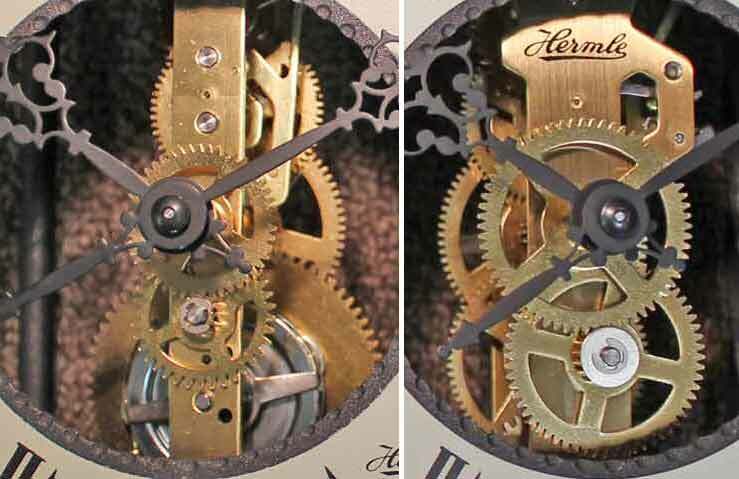 The image on the right is the movement used in the Hermle Premium series. These use larger plates, wider gears, and substantial supports. The Premium series uses posts and bell caps that are solid brass. The bell strike hammer is smaller and more defined so it may be easily adjustable. The lower posts are solid wrought iron which are cast in in a twisted design to eliminate any torquing in the movement especially while the weight is brought back up to the top as opposed to a threaded rod covered by a black painted tube. Both clocks movements are made by Hermle in Germany. The weight on the Standard series is cast iron painted black whereas the Premium series will offer a dual lacquered finish in black and gold so it looks more like an antique finish. Again, you will see the polished brass post caps on the Premium series. The Premium movement is made with wide, polished pivots to hold the gears between the plates manufactured the same way as their clock movements that are used in clocks that sell for over $1000.00. These will hold oil much longer and these will last well over twice as long as their less expensive counterparts. Hermle Antique Dial antiqued wall clock features a wrought iron case. Pewter-tone bell. The 8-day weight driven passing bell strike movement. Hermle Hamburg satin gold-tone, all metal antiqued wall clock features a wrought iron case with side columns. White Roman numeral dial with a gold rim. Gold-tone bell. The German 8-day weight driven passing bell strike movement has a matching antique style weight and pendulum. Made in Germany .Three year warranty and free shipping.